Is your awesome new media room poisoning your family? Five years ago, my newly-pregnant wife and I sat down with our realtor to discuss our needs for a new home. Naturally, my wife came to the meeting armed with a long list of well-reasoned stipulations involving such practical requirements as adequate closet space, and a room in which the baby could sleep. I, on the other hand, had a singular, somewhat selfish wish: a large, unfinished basement. As an A/V reviewer and unapologetic lover of huge speaker systems that go “boom,” I had long struggled to reconcile my profession and passion with apartment-style living and the noise-control issues that come with it. As you can imagine, testing a subwoofer’s low-frequency extension in a tiny living room with neighbors just 10 feet away on the other side of paper-thin walls is neither practical, nor conducive to friendly neighbor relations. The way I saw it, if I was going to have to spend every waking moment working to afford a mortgage, I deserved to finally have a place I could renovate into the ultimate entertainment space – one that brought me joy and satisfaction as I enjoyed ear-splitting volume levels without the risk of eviction. I spent a great deal of time and effort sorting out and implementing wiring solutions, lighting, soundproofing and acoustic treatments, all on a shoestring budget and with most of the work done myself. Finally, after five long years of slapping my dream together piecemeal, my basement had finally become a cozy, fun and safe place for my family and friends to hang out – or so I thought. I had not. In fact, I wasn’t entirely sure what my friend was referring to. As it turns out, I, like so many other basement renovators and home theater owners, was completely unaware that I could be putting myself, my family and my guests at risk of toxic exposure to a radioactive gas. There’s a good chance you’ve heard about radon before. And, if you are like most Americans (myself included), it’s likely that what you heard went in one ear, and right out the other. Perhaps what you heard wasn’t very convincing, or maybe your initial concern was quelled by dissenting opinion. Whatever the case, radon needs to be on your radar. Radon is real, and it can kill you. If you have a basement home theater or game room, or have plans to put one together, then you, especially, need to know about radon and how dangerous it can be to you and your family. We’ve taken an in-depth look at radon from every angle, and assembled everything you need to know right here. What is Radon and how does it get into my house? be swimming in the stuff and you wouldn’t know it – not right away, anyway. Uranium and thorium are the two most common radioactive elements on earth, so it stands to reason they are commonly found in the rocks and soil around us, albeit at varying levels of concentration. As these elements decay, radon gas is produced. Out in the open, radon slowly seeps to the earth’s surface and is released into the air where it quickly dissipates and does harm to no one. 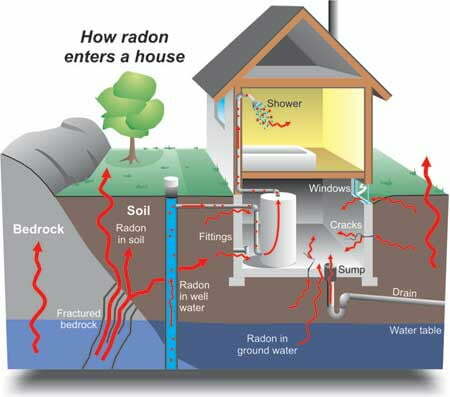 But when radon is produced in the ground around or underneath a building, it tends to want to enter that building. Radon finds its way indoors through cracks in foundations, basement walls and floors, and even the floors of buildings without basements, if the conditions are right. It does this because our buildings tend to exhibit negative pressure – essentially a partial vacuum. The pressure in our homes is less than that of its surroundings, so gasses – both good and bad – want to get inside through any nook or cranny they can. What’s so bad about radon? Unlike many other radioactive materials, radon can’t hurt you just because you happen to be in its vicinity. Your dead skin-cell layer is enough to keep radon out of your system. Instead, radon wreaks its special brand of havoc when it gets into your lungs. As radon decays (which it does very quickly) it attaches itself to things like dust particles. When these particles are inhaled, they damage the cells that line the lungs. According to the EPA, radon is estimated to be responsible for about 21,000 lung cancer-related deaths in the US per year, 2,900 of which are non-smokers. It is the number one cause of lung cancer among non-smokers and the number two cause of lung cancer overall, just behind smoking. You read that right – apparently more people get lung cancer from radon exposure than they do from second-hand smoke. Did we mention this stuff could be in your house right now? Actually, radon is present almost everywhere in very small quantities. In fact, you breathe it in every day. It’s high concentrations of radon you need to be concerned with. So let’s take a look at potential radon hot-spots. The EPA says that while building construction can affect radon levels, radon can be a problem in buildings of all types, be they old, new, insulated, or drafty. While it is true local geology, construction materials, and how a building was constructed all factor into the potential radon levels found in that building, there are certain circumstances that put some buildings at higher risk for radon contamination than others. Any building with a basement has a potential for high radon levels. Because basements are located underground, the concrete walls and floor that form them are in direct contact with the soil and rocks which could possibly be producing radon. And, because concrete can tend to crack over time, those fissures will allow radon to seep into the home. It is important to note that just because radon could pool up in a basement, it is not necessarily going to spread into the rest of the home, though that is a possibility. Homes with crawl spaces underneath them might seem like they would be less susceptible to radon exposure, but that isn’t necessarily the case. If the crawl space is inadequately ventilated and/or if there is a lack of a vapor barrier in place, radon can creep right up through the subfloor. Interestingly, the more we do to keep cold or hot outside air from coming in, the more we are inadvertently inviting any radon that might be under the home, into the home. Remember that negative pressure thing? The more we seal up our homes against the elements, the more negative pressure we build up, thus making any underground pathway into our home that might exist just that much more inviting. The bottom line is this: Don’t assume that your home type exempts you from radon problems. As we’ll soon discuss, the EPA’s stance is that everyone test their home for radon – no exceptions. Radon testing can be broken down into two main categories: short term and long term. It is recommended that you begin with a short-term test (taking 2 to 7 days) to determine if you are at high risk. You can then follow up with a long term test (takes closer to 6 months) if short-term testing reveals low levels of radon which, measured on the long term, could amount to something more significant than the short-term test would indicate. Test kits are available at most home improvement stores such as Home Depot or Lowe’s. However, these kits, which may only cost $10 to $15 at the register, can wind up costing much more in the long run because they must be mailed to a laboratory for testing, which incurs postage fees and lab fees, potentially adding $30 to $40 of expenses. If you choose to go this route, it is best to check the fine print on the test kit’s packaging to find out what is and isn’t included in the purchase price. There are several less expensive and readily available alternatives to store-bought kits. 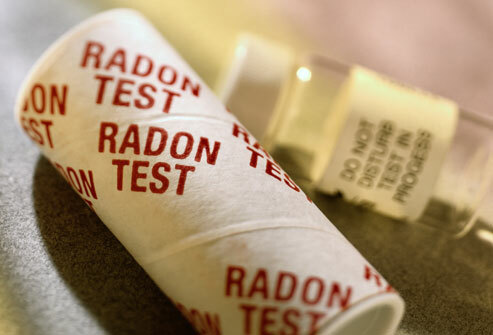 Most states and/or cities run government-funded programs for distributing radon test kits, which cost significantly less than store-bought alternatives – the EPA offers this site for seeking out local information related to radon testing. We also recommend checking your local American Lung Association chapter or the National Safety Council. The kits distributed by these organizations are generally $10 to $15, and include postage and lab fees in that price. The EPA strongly recommends you take action to deal with radon if tests show radon levels at 4 picocuries per liter, or pCi/L, or higher. That means if your home tests at or above that level, you should definitely do something. But the EPA also says that radon abatement measures are a good idea if any radon is detected in the home. While you might think that sealing your home up so that radon doesn’t get inside in the first place would be an effective move, the EPA feels that is not enough because sealing has not been shown to be effective. Instead, the EPA recommends a rather simple solution that essentially amounts to a pipe that runs from under a home to the outdoors in a location away from windows, doors or anywhere else radon could come back in. If radon is such a big deal, why don’t I hear about it more often? This is a very good question. When we first started digging into this issue of radon, we contacted Brett Sherry, Radon Program Coordinator for the state of Oregon. He’s been shouting from the rooftops in an effort to increase radon awareness for six years, and we could sense he’s a bit frustrated that, despite a great deal of effort on his part and on the part of people in his position around the country, radon remains relatively unknown. Information about radon is, however, supposed to be disclosed as part of the home sale, noted Hayes. In California, home buyers are presented with an environmental impact study which lists out whether the home is near an earthquake fault line, sitting in a flood zone or potential flood zone, and whether there is known issues of radon gas in the area, among other issues. But, as is often the case in real-estate transactions, this paperwork is often glossed over. There are other issues plaguing radar awareness as well. 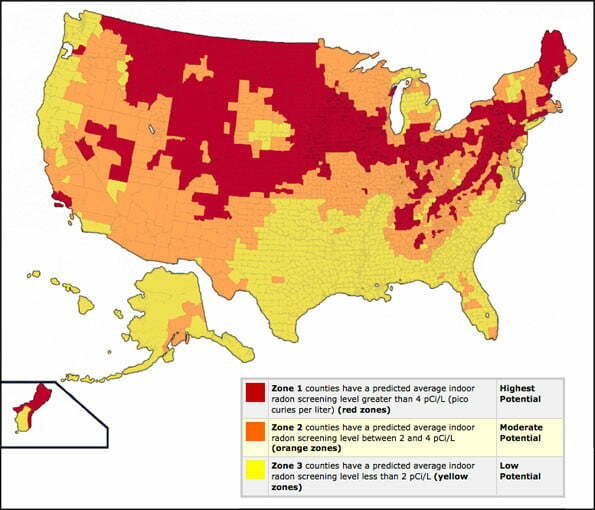 In a rather ironic twist, the EPA’s own map of radon zones may be responsible for lulling people in certain areas into a false sense of security. Though the EPA states explicitly that the map is not intended to indicate whether homes in a particular zone should be tested, it seems that is exactly what the majority of the public take it to mean. If the zone you live in is colored yellow, and yellow means low risk, then why not assume you are at low risk? It seems that, for any given issue – especially those that receive government support – there is a segment of the public eager to dissent, cry foul, or otherwise declare conspiracy is at play. Despite an overwhelming amount of documentation showing that radon is a real threat, there are plenty of online forums and message boards filled with comments by those who refuse to believe that radon is a clear and present danger. A quick Internet search brings up plenty of examples. We picked two, which you can see here and here. We showed those message strings to Brett Sherry, and asked him if he thought the kind of nay-sayer attitude seen in those examples is prevalent enough to cause damage to the sort of informational campaign he and his colleagues in other states are working on. “Yes,” asserted Sherry. “ Folks actually pay attention to these types of rants, even when the World Health Organization, the Environmental Protection Agency, the Center for Disease Control, the Surgeon General, the American Lung Association, etc. say otherwise. As for the “pile of bodies” of folks that have died from lung cancer, they are correct. You don’t usually hear folks say that someone died from radon, they say they died of lung cancer. It doesn’t help the matters that there are some who actually seek out and intentionally expose themselves to high levels of radon. The Free Enterprise Radon Health Mine is a sort of “radon spa” located in Boulder, Montana. People travel there to sit in underground “galleries” and “radon rooms” and intentionally breathe in high levels of radon gas. According to the health mine’s website, patrons engage in this intentional exposure to relieve themselves of conditions and symptoms related to breast cancer, asthma, emphysema and bronchitis, among several other ailments. The practice has long considered to be quackery, but for those unaware, it would appear to simply throw mud in the face of those who maintain radon is dangerous. The good news is that action is being taken to prevent radon exposure as states adopt building policies that attempt to put radon in check. Nebraska, for instance, is committed to ensuring that, by 2015, all new buildings will be radon resistant. But it would seem that it is going to come down to us, the general public, to spread the word to existing home owners about the dangers of radon. Were it not for my realtor friend, who knows how long it would have taken before I took action? Now, as I write this, I have a radon test kit deployed and should know more in the coming weeks. When will you be testing for radon?